Providing great value for money, the all new Slimbridge Rennes expandable suitcases allow for plenty of packing space inside. 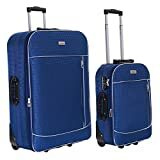 The two corner positioned tractor wheels are great for pulling the luggage case along effortlessly, which makes this suitcase a brilliant choice if you are travelling long distances. This entry was posted in Luggage and tagged Expandable, Navy, Rennes, Slimbridge, Suitcases by Perfect Vacation. Bookmark the permalink.